The hardest part in kitchen remodeling is finding the right backsplash color. Backsplash Color Selection For White Kitchen would be helpful for your dilemma. I do not want to give many details for your dizzy heads. Only the Backsplash Color Selection Tips that you read below are quite helpful. If you need more detail, please visit my very fist article as :What is Backsplash ? Kitchen Backsplash Ideas. 1- Countertop is your main guide for backsplash color selection. If you have a patterned or busy countertop , your backsplash would stay still. 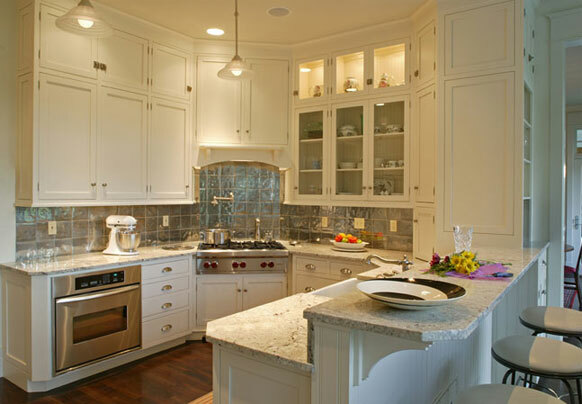 2- There are many white tones in white kitchen cabinets. When you are going to decide to have a backsplash tile, cabinet color is your life saver. ( So you have already matched the cabinet color and countertop ,follow the rule 1. ) If you have white kitchen cabinets which are made with blue or gray tones, please hesitate to go for the cream tone backsplash colors. If you have white cabinets with yellow and green tones , they won’t be good match with gray tones. If you are not making the best decisions about Backsplash Color Selection for White Kitchen, stay on the safe side and go for only white backsplash. White backsplash is always good. 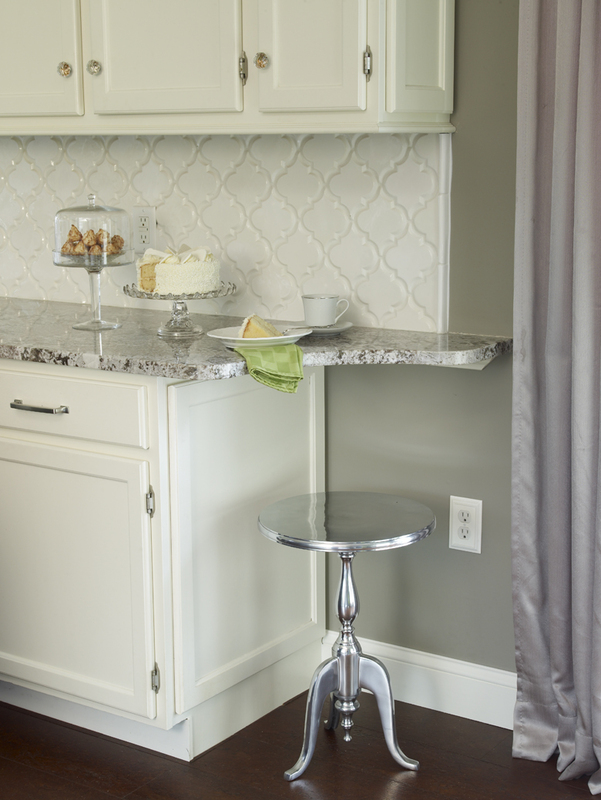 Another option to prevent confusing using the countertop material as full high backsplash. 3- Usually natural color backsplash gives a good touch to your kitchen. But your personality is also important as well as your kitchen space. In spacious and natural lighting kitchens, attraction of opposite colors are ended up with excellent results. Another reminder for the rule of the small kitchen remodeling ideas: Light color backsplash and large backsplash tiles have always an ample feeling. 4- Grout Color Selection also effects the backsplash color selection for White Kitchen. Same as rule 3, darker grout colors turns very well in big and light catching kitchens. When I was surfing on the internet I have found this page for grout color selection and would like to share with you. I have picked my bests from my album to show the Backsplash Color Selection For White Kitchen. I share the type and material of the backsplash tile and some commercial backsplash names and codes under the pictures. Picture Credit:Philadelphia Magazine’s Design Home.,Titanium Leather Granite Countertop is a good combination of Bianco Extra Marble island top. Backsplash is Maniscalco’s Bianco Carrara Polished Marble mosaic octagon tile with black dots and Newport White cabinets. Flooring is vintage white oak hardwood. Picture Credit:Sonya Kinkade Design. New Venetian Gold, similiar to Santa cecila dates with the perfect backsplash with cream color kitchen cabinets.Backsplash is Botticino Marble Mosaic. Picture Credit:Real Life Kitchens and Baths designed by Karen Viscito Interiors., Amazing trio are singing together in the white kitchen. Beveled Arabesque tiles, Benjamin Moore Cloud White ,white cabinets and Bianco Antico Granite Countertop with dark color hardwood flooring. The Designer has definitely have a rich taste. Picture Credit: World Contracting LLC., I fall in love with these trio. White Cabinets with parliament blue knobs, white fantasy countertop and handmade cobalt blue diagonal lay out tiles. Tile connectors are dragonfly embellished small white pieces. the contrast around the kitchen is amazing. The flooring is red oak hardwood flooring. The glass door cabinets and hook top are in good size. Very sharp eyes for meticulous design. 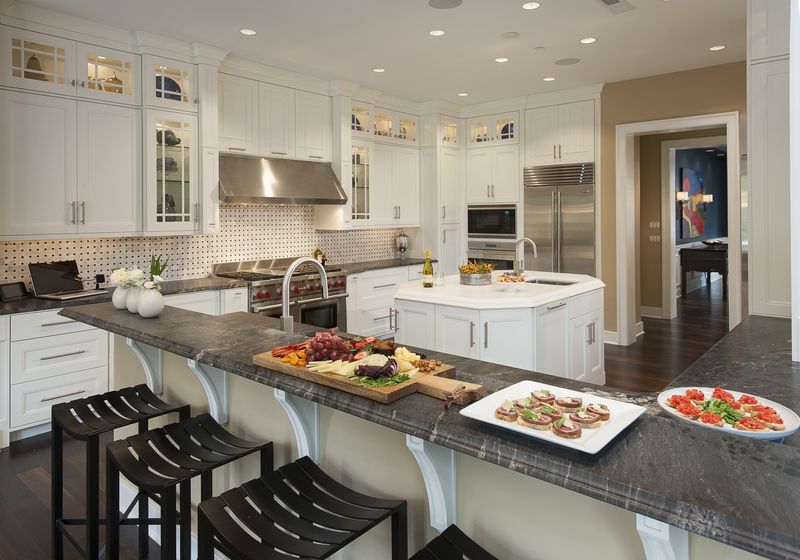 Picture Credit: Lynbrook of Annapolis.The layout of the kitchen shows the beauty of square stainless stain backsplash and Bianco Romano Granite used in Countertop and raised breakfast bar. Red oak flooring and customized cream cabinets are amazing. Very admiring design. Picture Credit: Judy Cook Interiors, LLC. Blue gray glazed subway ceramic tiles supplied from Sonoma Tile’s Ashbury Collection. The color is Breakwater. Off white cabinets, stainless steel appliances and beautiful queen: White Ice Granite. Fresh looking ergonomic design. Picture Credit:Kitchen Design Concepts., 1×2 Split face travertine subway backsplash, and tumbled travertine chair rail rhombus backsplash inlay . Both are from InterCeramic. ,Giallo Ornamental Granite and white cabinets. Delightful taste in kitchen remodeling ideas. Picture Credit: Leslie Ann Abbott , Interior Designer and Dennis Mayer Photographer. Colonial White Granite with black subway tiles called new night sky and white cabinets, The white corner shelve are bonus: I really like the artisan cabinetry with arches and ceiling details. Glass door wall cabinets with inside lighting are amazing. The coordination of contrast between the colors is excellent. Picture Credit: Solara Designs Inc., Utterly amazed. Custom Handmade Glass Backsplash, Destin with Mocha Glazed cabinets and lovely Typhoon Bordeaux. Designed for deity…. Picture Credit: Cherry Hill Cabinetry., Very effective use of the small space and very keen eyes to show the small kitchen as big as possible. The color selection is the best with white maple glacier cabinets , Icelandic Blue color glass subway backsplash and Cambria Praa Sands Countertop and Islandtop. White oak flooring with natural finish gives some fresh and neat looking to the kitchen. In cabinet lighting and glass doors on both sides keep the cabinets over the island from making the space feel closed in. Trim under two- sided hanging cabinet is very creative and inspirational idea.That makes the kitchen more elegant. Picture Credit: Cucina Bella Ltd., Inspirational upscale bold taste in kitchen remodeling from up to toe. Very modern and very ergonomic design for transitional kitchen. Dropped in Coffered ceiling , Maple Cabinets with English Cream Paint, Stainless Steel Appliance , Classic Ivory Travertine square and mosaic backsplash ( inlay is herringbone set up ) , eternal color wall paint which is a paint color to complement Cambria Berkeley (BarnBoard CC-572) and Terra White Oak Drift Wood Designed porcelain flooring show all the beauty of Cambria Berkeley. Cambria Berkeley is used as perimeter top and over hang island top . Kitchen lighting is natural and coerced with kitchen recess and pendants. Two thumbs up design. Picture Credit: Custom Granite & Marble Ltd., Natural Slate Charcoal Color Backsplash with with white cabinets and shiny Cambria Torquay. Very delightful and cozy for limited space small kitchens. Small kitchen remodeling is such a fun. Picture Credit:Annette Dimeck, Kitchen World ., Travertine matchstick backsplash by Jeffery Court with pearl white paint cabinets and Cambria Windermere. Color selection is very effective to show the beauty of quartz countertop. Picture Credit: Oakville Kitchen and Bath., Cambria Bellingham is used for two main purpose: Full High Backsplash and Countertop and Island top. 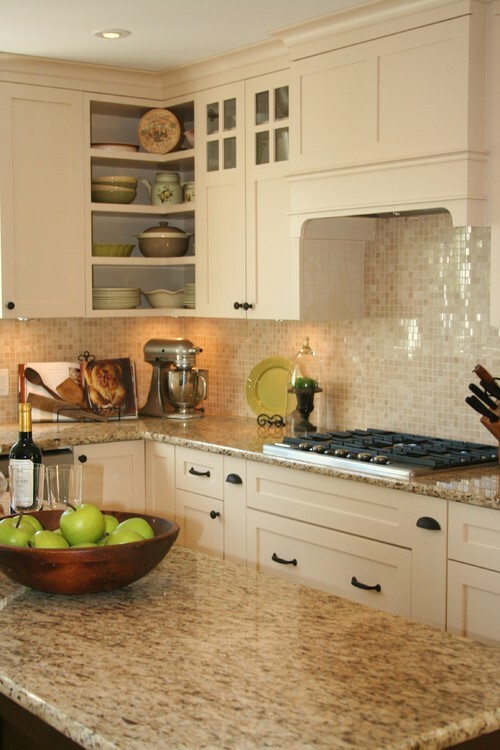 Stainless steel appliance and glass door wall cabinets give the priority to the backsplash. Willow White cabinets are very elegant. Very keen eyes to collect the details. Hope all my advise and pictures will find you well about Backsplash Color Selection For White Kitchen. Please share your experiences.